Thunderbirds Ryan Gropp with the puck against Spokane. The Thunderbirds entered Friday’s action having lost their previous two meetings against Spokane, being out scored 11-3. The atmosphere at Showare Center seemed to energize the Tbirds as they rolled the Chiefs on the strength of an Ethan Bear hat trick. Both teams came out of the gate playing on the cautious side, trading only one shot a piece through the first five minutes of play. After successfully killing off a penalty, the Thunderbirds (18-9-2-0) would strike on their first power play of the game on an Ethan Bear bullet from the point. The remainder of the first period would see the Chiefs (16-11-2-1) try hard to even the score, but Seattle net minder, Logan Flodell shut the door. 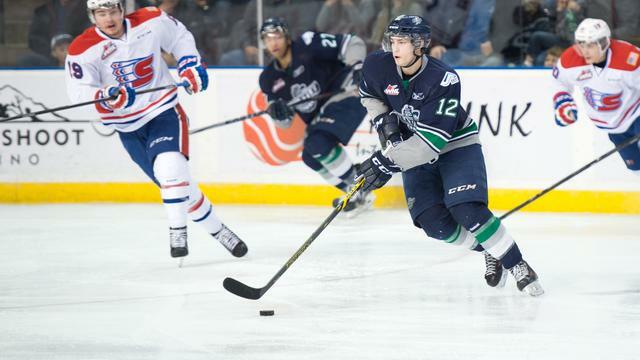 Seattle would add to their lead less than two minutes into the second period, when Tbirds right winger Jamal Watson rifled a wrist shot top cheese from the left hash mark on a breakaway from the Spokane blue line. Ethan Bear then added his second goal of the game on the power play in the middle part of the frame. Keanu Yamamoto of Spokane cut the Tbirds lead to two at the end of the second, but Seattle’s Logan Flodell answered whatever the Chiefs threw at him the rest of the game. Keegan Kolesar padded the Thunderbirds lead early in the third on a nifty backhand shot over the right shoulder of Chiefs goalie, Tyson Verhelst. The two clubs would trade chances for the remainder of the period until Ethan Bear ripped home a shot at the 18:13 minute mark, completing his first career hat trick. Thunderbirds defenseman Ethan Bear gets the nod tonight, leading the Tbirds offense with three goals and also adding one assist. Bear’s offensive production is going to be relied upon heavily as Mathew Barzal, Scott Eansor and Alexander True are all headed to the World Junior Championships until January. Seattle is right back at tomorrow night Sat Dec 12, 7:05, at Showare Center, in Kent, WA. They welcome in town rival, Everett Silvertips for their second meeting of the season.